Every start of a new season, I love trying some new beauty products to suit the needs of the change in temperature and mood. 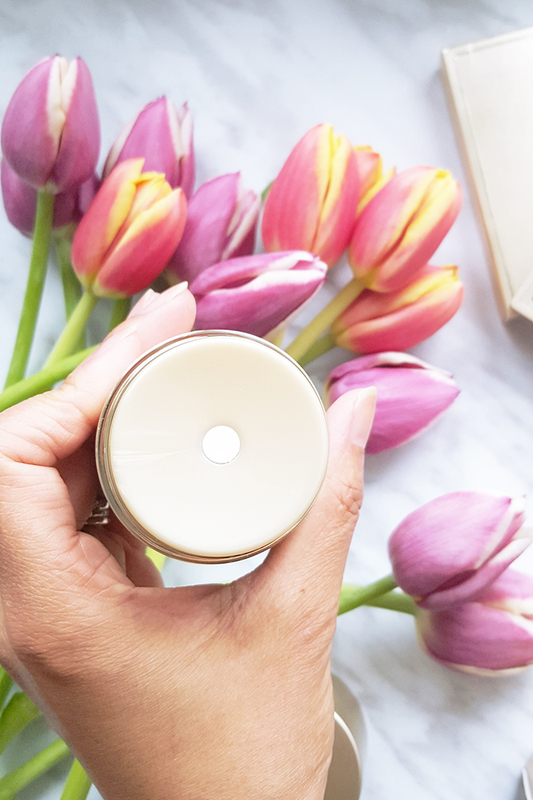 Spring is such an exciting time, it’s when we finally all come out of hiding and start to introduce bright colours and fruity scents to our daily routine. I came across a few new beauty items that I’m so excited to use on the daily, and most of all share them all with you! 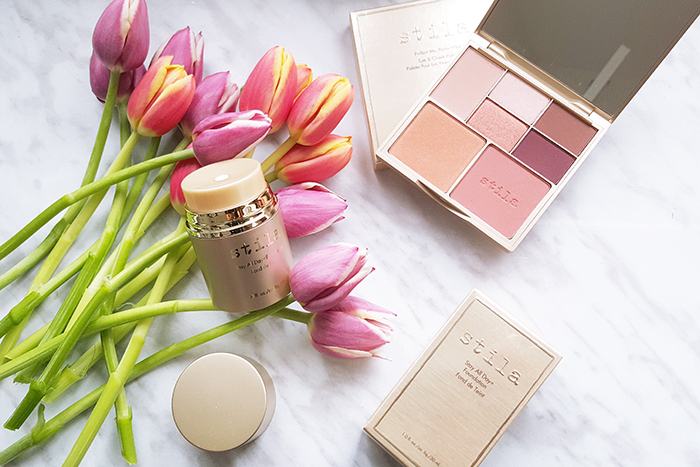 Have you added any new beauty finds to your vanity this Spring? 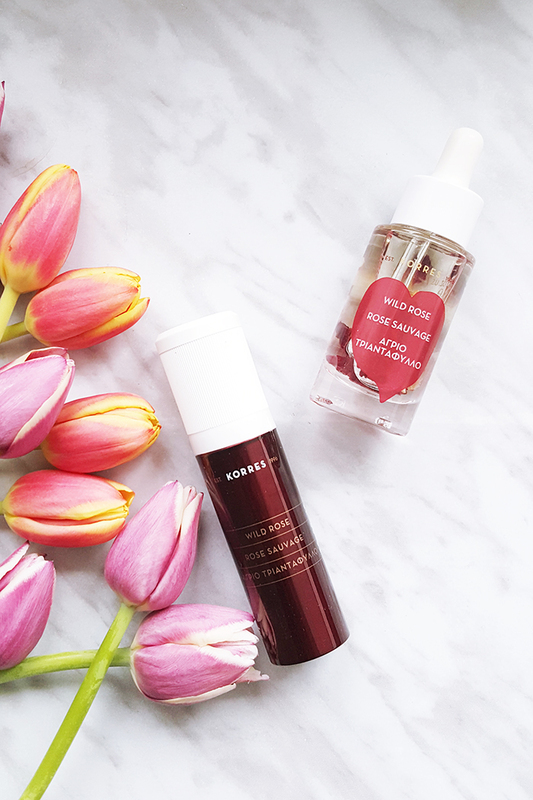 I’m new to KORRES and absolutely adore the Brightening Targeted Tone Corrector and Vitamin C Active Brightening Oil from their Wild Rose collection. Both products are suitable for all skin types. The Corrector is an intensive facial treatment that helps reduce the appearance of skin discoloration. Enriched with targeted actives, pure vitamin C and Wild Rose oil, it offers radiance and restores even skin tones. As I’ve recently came back from a Costa Rican vacation, my skin has been suffering from some discoloration from the sun, therefore I’m really enjoying this product at the moment. This can be applied day and night to face and neck. 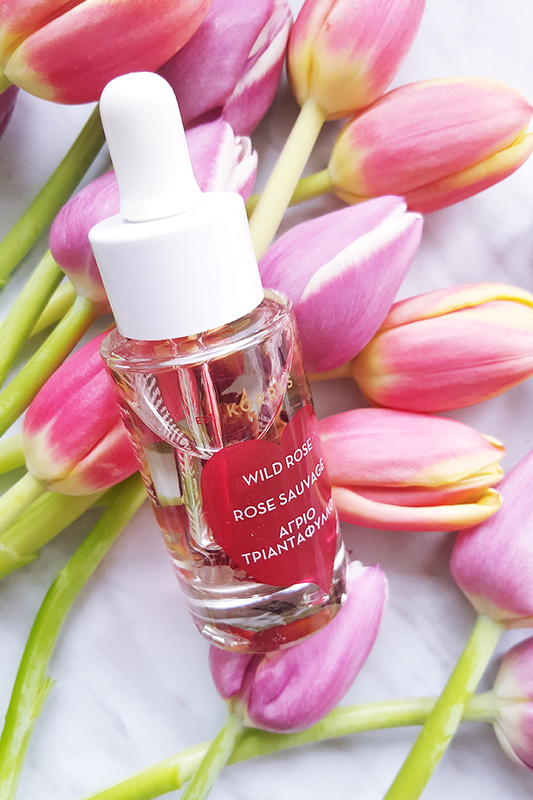 I’m sure you’ve read about the benefits of facial oil, I’m particularly smitten by this Wild Rose oil because it smells fantastic and as you can see from the bottle, it is infused with real rose petals. This oil is ultra concentrated with vitamin C which brightens, evens skin tons, and reveals smoother and younger looking skin. This oil is fast absorbing and non-greasy, rich in essential fatty acids and powerful antioxidants. Gently massage a few drops on a cleansed face and neck and start to enjoy the benefits it offers right away! I’ve been a long time fan of Stila products and always excited to add new products to my current collection. I’ve been searching for a new foundation recently and was introduced to the relaunched Stila Stay All Day Foundation. This foundation is high definition, long lasting, full coverage and offers a matte finish which is extremely important if you’ve got oily skin like me. Whether you choose to apply with a sponge or brush, the dish pump dispenses just the right amount of foundation without any excess spills or mess. For Spring, I like to use softer pinks and touches of shimmer for my eyes and cheeks. The Perfect Me, Perfect Hue Eye and Cheeks palette features 5 neutral eye shadows and 2 coordinating blushes which work really well together to enhance personal skin tone, whether you’re fair or darker in complexion. The eye shadows can be used wet or dry which means you can play around with intensity levels for day or night. We all know that EOS (Evolution of Smooth) is famous for their cute lip balms. But did you know that they recently launched a line of body lotions and shave creams?! 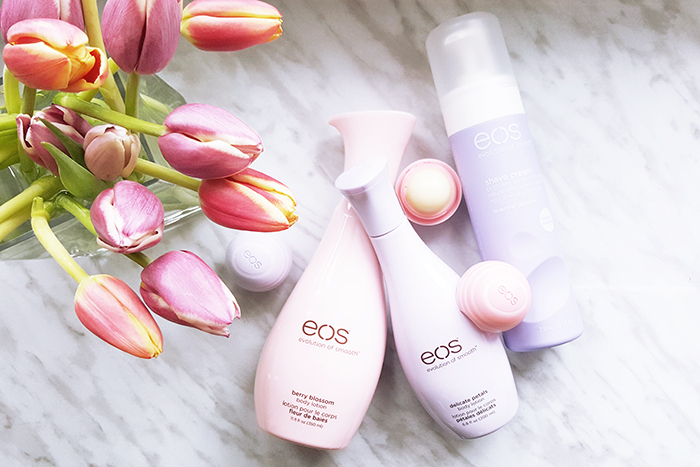 I was so shocked to discover these two new lines from EOS and have been lathering myself with their lotions since. The EOS shave cream is also my personal favourite because it is super moisturizing unlike the usual shaving gels from those arousal cans. The team at EOS really wanted to stay consistent with their successful line of lip balms when it came to design, scent, and moisture, I’m so thrilled that these characteristics are also present in both the lotion and shave cream products. I’ve always been drawn to fruity and floral notes when it comes to fragrances. 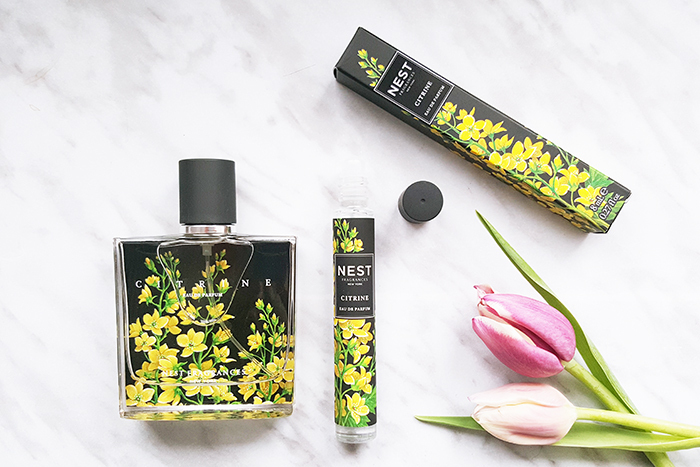 This Citrine Eau De Parfum from NEST fragrances is the perfect scent for Spring. It offers a dewy softness of lotus flower and freesia mixed with sparkling citrus notes and bits of precious wood. The main fragrance notes are lemon blossom, lotus flower, freesia, dew drop accord, and precious wood. The rollerball is the perfect purse companion while the full size bottle is a decor piece of its own, I absolutely adore the packaging and how suiting for Spring! I hope you enjoyed some of my favourite Spring beauty finds and let me know what you think of them! Some of these are so great for mom this Mother’s Day too, especially the Korres and Nest products.